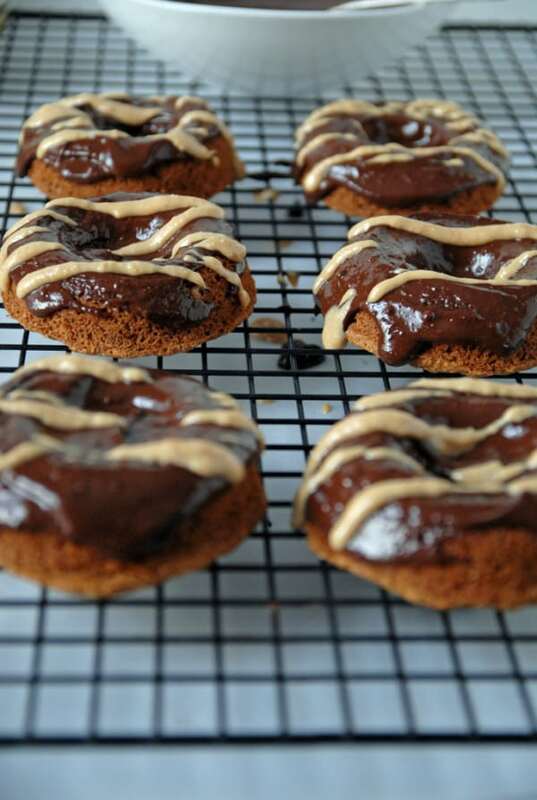 There are really no words for these dark chocolate peanut butter doughnuts except amazing, life changing, and you best go make these now! These were originally planned to take as a treat for work, but they turned into a commodity very quickly. One of the first things my boyfriend said when he walked through the door the other night was “Where are those doughnuts? I want one!” He has obviously seen the picture I posted in Instagram earlier in the day, and as a sucker for anything chocolate he was quick to claim one before they were whisked away to the office. 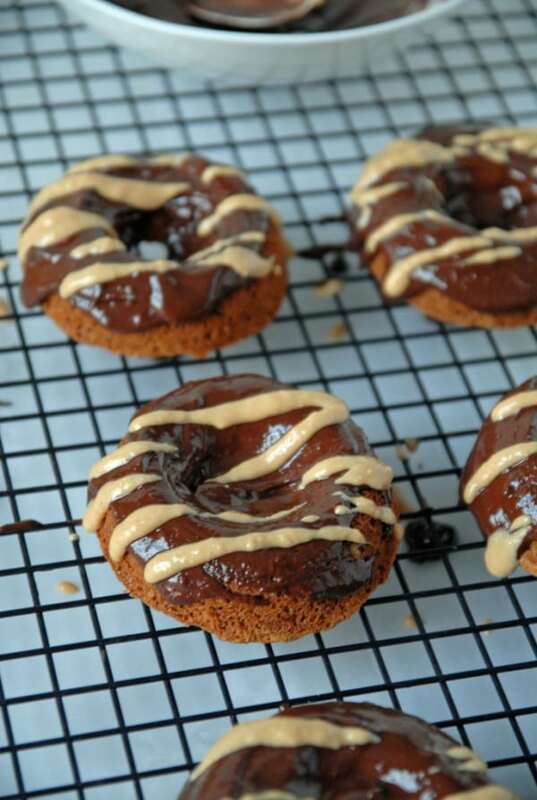 The recipe for these decadent vegan doughnuts is courtesy of Ashley’s incredible doughnut cookbook. 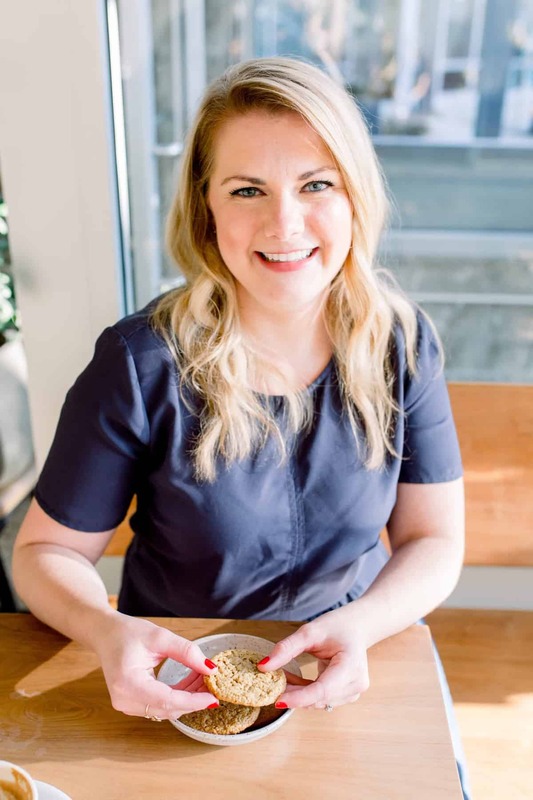 Back in the fall I made these maple doughnuts to celebrate the release of her cookbook, but now I’m asking myself why I waited SO long to make these doughnuts. Also, if you don’t own a doughnut pan, just go ahead and get one, it’s a good $12 well spent and you won’t ever look back. (I have this one and love it). Can we also talk about something weird? I automatically want to spell this is ‘donut’ not doughnut, is that wrong or is this an either or situation? Let me know your thoughts, ok? These are pressing issues. So just take an hour or so, crank out some doughnuts, and share them with your friends (also lick the frosting bowl, because YOLO man.). Happy Friday! 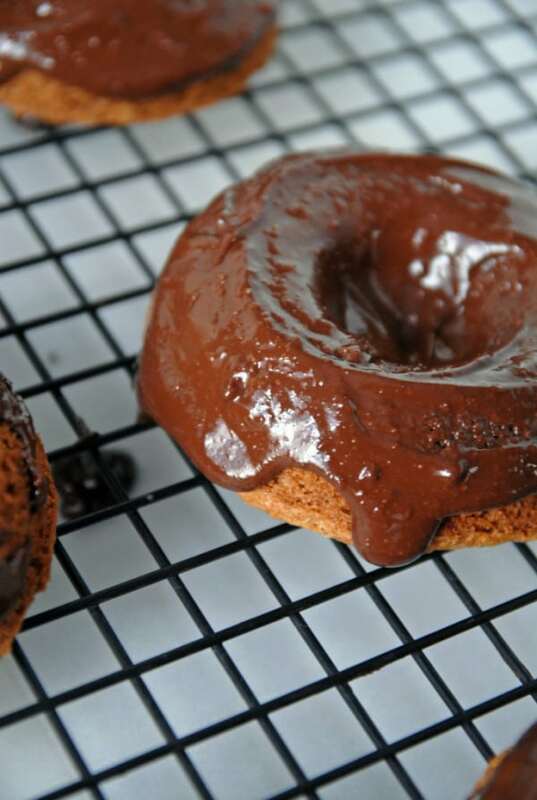 These homemade vegan doughnuts are incredibly easy to make and require no frying. 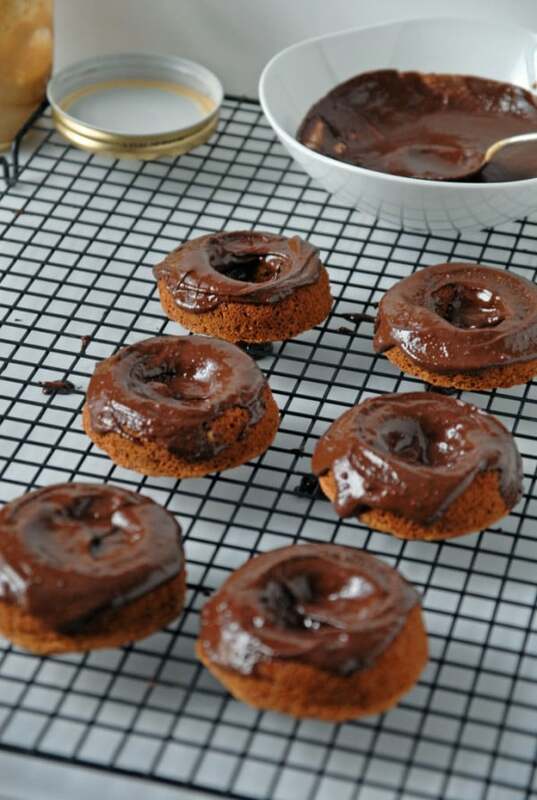 If you feel comfortable making brownies, you can make these chocolate peanut butter doughnuts! All you have to do is mix together the wet and dry ingredients in separate bowls, then combine everything and stir it all together. Don’t let the long list of ingredients scare you, I bet you have most of them in your pantry already. The one ingredient you might not have on hand is peanut meal. Peanut meal is essentially ground up peanuts that have had some of their fat removed (it’s like almond meal or almond flour, but it’s made with peanuts!). In a pinch, you can grind up some peanuts yourself in a food processor or blender to use in this recipe. 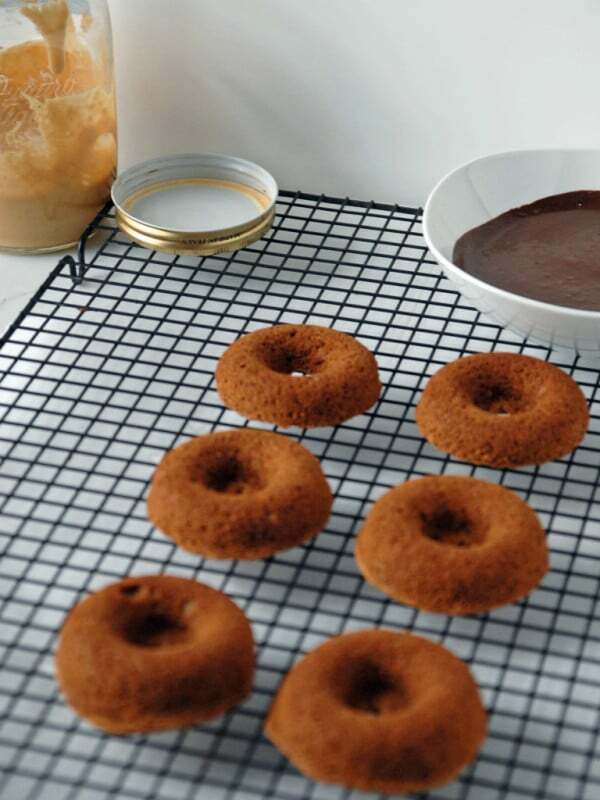 It won’t be quite the same, but your homemade doughnuts should turn out fine! You’ll also want to make sure you’re buying vegan dark chocolate if you can’t have any dairy. Most dark chocolates are naturally vegan, but dairy products have a way of sneaking into chocolate bars so it’s always best to double check. 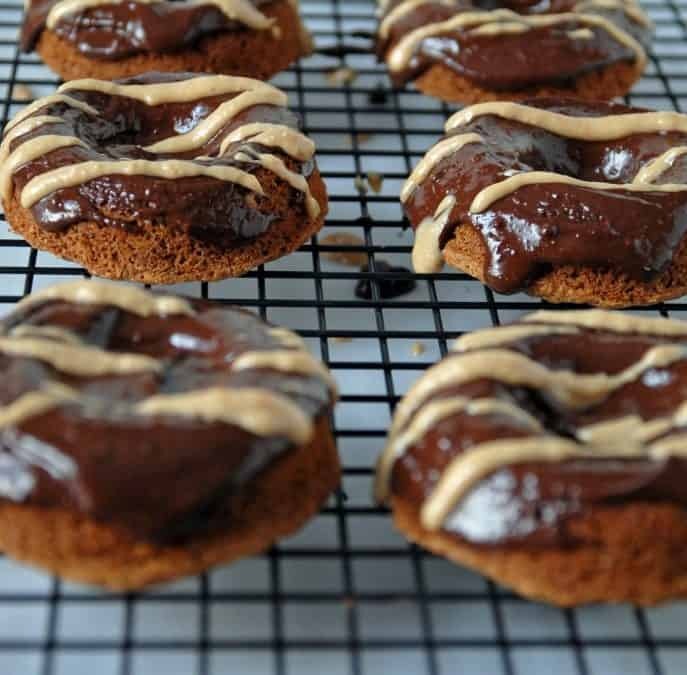 These dark chocolate peanut butter doughnuts are baked, not fried, and feature a rich chocolate frosting and peanut butter drizzle. Preheat oven to 350ºF. Grease doughnut pan and set aside. In a medium bowl, combine all dry ingredients. In a separate small bowl, combine all wet ingredients. Combine wet and dry ingredients in medium bowl and stir until just combined. Spoon the batter into the pan, filling the wells about 3/4 of the way full. Bake for 18 to 22 minutes, or until a toothpick inserted in the middle comes out clean. Cool fully before frosting. To make the frosting: In a small heatproof bowl, combine dark chocolate and peanut butter and microwave for 30 second intervals, until chocolate is melted (be sure to watch the mixture, so the chocolate does not over cook). 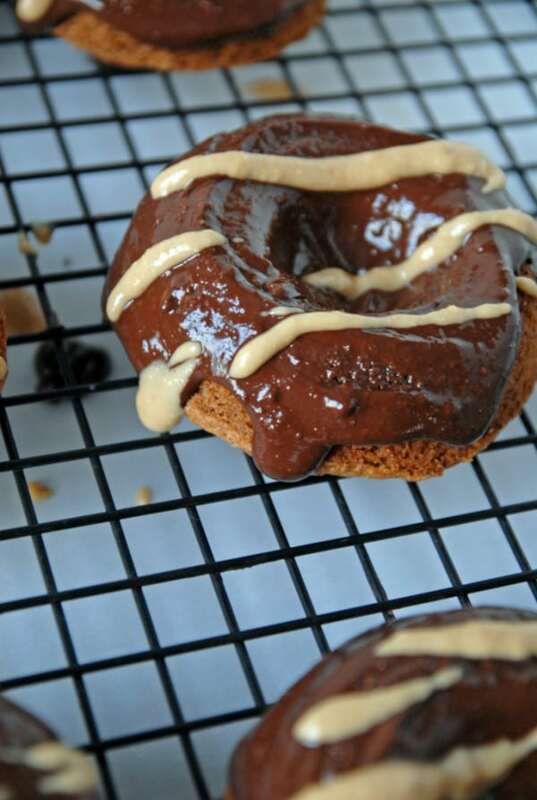 Spoon frosting over cooled doughnuts and drizzle extra peanut butter on top. Oh my.. these look so amazing! I love this recipe! Thanks so much for sharing!! I’m with you on donut vs doughnut. You got me curious so I just did a search and found “In the UK, donut is indicated as an American variant for doughnut.” I say we go with the American variant! Yum these look amazing. Sometimes I write donut instead of doughnut too, and my soul dies a little inside because it’s like WHY YOU DO THIS? That’s funny that your boyfriend knew you made doughnuts because you posted it on instagram. I’m lucky if my boyfriend checks his phone, let alone instagram haha. He’s the worst at technology unless it’s related to school haha. I would be the world’s best mom if I made these!